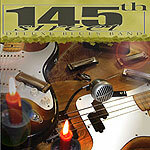 CD review: "145th Street Deluxe Blues Band"
There was a time  okay, about forty years ago  when the blues was everywhere, even on the rock scene. Heck, particularly on the rock scene. From the barely distilled blues of Savoy Brown and Fleetwood Mac to the distorted sounds of Robin Trower or Foghat to the psychedelia of Jimi Hendrix, the blues permeated everything that the white kids were listening to. And while the blues remains the basis for just about everything in popular music today, both the influence and the acknowledgement get further and further from us. Unless you're San Diego's 145th Street Deluxe Blues Band. This electric blues-rock quintet is so steeped in the blues they practically drip the music. Like Savoy Brown or Humble Pie (two obvious influences), the music of 145th Street Deluxe Blues Band is a full-on homage to their blues heroes. Their first studio CD contains a cover of Lowell Fulson's "Reconsider Baby" and Muddy Waters' "Walking Through the Park"  both songs being straight-ahead versions that not only serve as credit to their composers, but to the band as well. Lead singer Steve Bulger has a strong voice that handles both covers and originals with ease and personality; his harp playing is its equal. Guitarist Marc Marrewa has that cocky bravado one wants in a blues guitarist. Doc Holladay's organ is the perfect foil for Marrewa's guitar. Rollin Rodgers' bass playing is up-front and lends the band's music much of its muscle, while drummer D.J. Jackson has the full arsenal of blues beats down cold. Nothing to set the world on its ear here  just solid, joyful blues that reminds us why this music once appealed to an entire generation of kids.